Kayaks and canoes are a great way to explore Branson’s beautiful lakes, but the next time you’re down for outdoor adventure, stand up on a paddleboard instead. 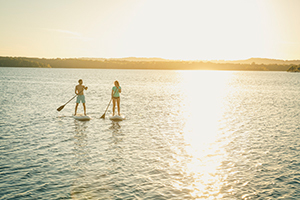 Stand-up paddleboarding – an activity that’s become increasingly popular in the U.S. in recent years – combines some of the skills of surfing with the easy pace of kayaking. Rest assured, you don’t need to be able to surf ocean waters to enjoy paddleboarding. If you can stand up on the board and use an oar, paddleboards are for you. 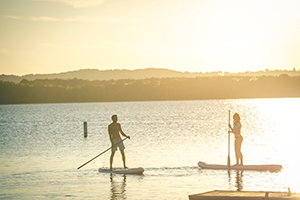 Table Rock Lake offers a wide-open setting for your paddleboarding adventure, while the gentle current of Lake Taneycomo may lessen your workload while paddling. If you need help planning your outing, locations around Branson are ready to assist. Among them is Kayak Branson, which rents and sells stand-up paddleboards and serves guests seeking adventure on both Taneycomo and Table Rock lakes. Rentals are available from two hours to all-day. For details on options and rates, check out Kayak Branson online; note renters younger than 18 need permission from a parent or guardian. For a surf-and-turf type adventure (sorry, meals aren’t part of the package) explore the options at White River Kayaking, a one-stop shop for canoe, kayak, paddleboard and bicycle adventures in the Branson area. White River Kayaking’s paddleboard trips are ideal for exploring the area around Moonshine Beach on Table Rock Lake and Lake Taneycomo near Branson Landing; they also provide access to Bull Shoals Lake. Remember stand-up paddleboarding is just one of many great ways to explore Branson’s outdoors adventures. Start planning your Branson getaway today at ExploreBranson.com.